Wahl Copper Tones Shampoo is a perfectly balanced formula that will revitalise, refresh and enhance the natural red and brown pigmentation within your pet’s coat. Based on natural ingredients including peach, pear, passion flower and kiwi fruit, Wahl Copper Tones will also remove dirt, grease, stains and odours effectively. Wahl Copper Tones Shampoo is suitable for all animal hair types and will leave your pet’s coat bright, silky, and shining with health and vitality. 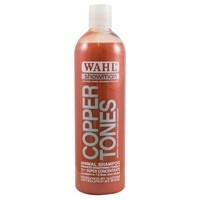 Please Note: Wahl Copper Tones Shampoo is a concentrated formula that will need diluting before use.